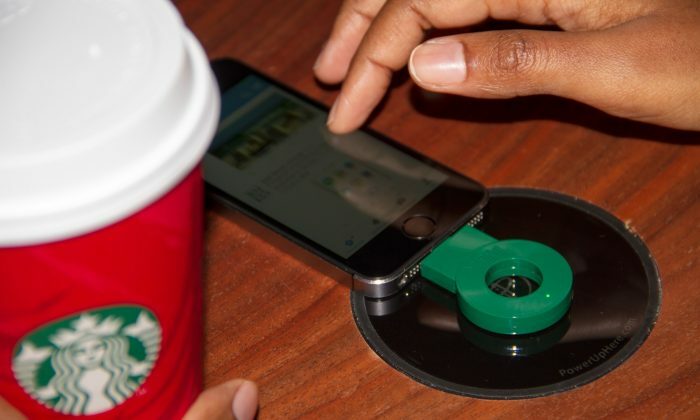 Starbucks has paired with Duracell to equip its shops with wireless charging stations embedded into the tables. The product is called Powermat, and it works by plugging in a circular power receiver into the cellphone and then placing it on the charging station. Starbucks wants to eliminate the anxiety associated with your cellphone battery going dead. “We have always tried to anticipate our customers’ needs and innovate with technology to provide even more convenience,” said Ian Cranna,Vice President Marketing & Category EMEA at Starbucks. “Our partnership with Powermat demonstrates Starbucks response to an increasing need to stay connected whilst on the go. We’re delighted to be the first to launch Powermat wireless charging in 10 London stores and look forward to customers being able to charge their phones wirelessly in many more stores soon,” said Cranna. You can either purchase a power receiver for $9.99 or borrow one during your visit to Starbucks. The Powermat receiver comes in mini-usb, and both older and newer iPhone port sizes, this means it is compatible with almost all smart phones currently available. It’s been a hit with customers so far.